The Atmospheric Imaging Assembly (AIA) instrument aboard NASA’s Solar Dynamics Observatory (SDO) images the solar atmosphere in multiple wavelengths to link changes in the surface to interior changes. Its data includes images of the sun in 10 wavelengths every 10 seconds. 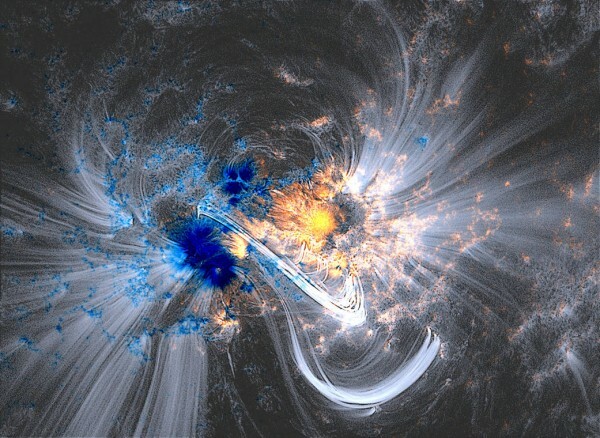 When AIA images are sharpened a bit, such as this AIA 171Å channel image, the magnetic field can be readily visualized through the bright, thin strands that are called “coronal loops”. Loops are shown here in a blended overlay with the magnetic field as measured with SDO’s Helioseismic and Magnetic Imager underneath. Blue and yellow represent the opposite polarities of the magnetic field. The combined images were taken on Oct. 24, 2014, at 23:50:37 UT.